Just sharing a work in progress, this little beastie is up to something mischievous, I just know it!! All the other creatures are looking on in curiosity, waiting to see what this guy is going to be doing. I hope that everyone is doing well with all this very crazy spring weather! So much about this year's season is odd to me - its challenging to go from sunny days to cloudy days to sunny....I truly look forward to more significant summer time sky's !! I've got a few big art and life projects underway right now that have kept me from blogging as much as I would like to! After launching the Etsy store and starting to show my creations around, I have received several commissions which are very fun and exciting. I'll share some pictures soon, when they are a little more progressed than they are now. I also have been doing a lot of research lately to start planning attendance at some art shows. I feel very blessed to follow the path of so many wonderful artists who have taken the time to experience art shows and share their invaluable perspective. 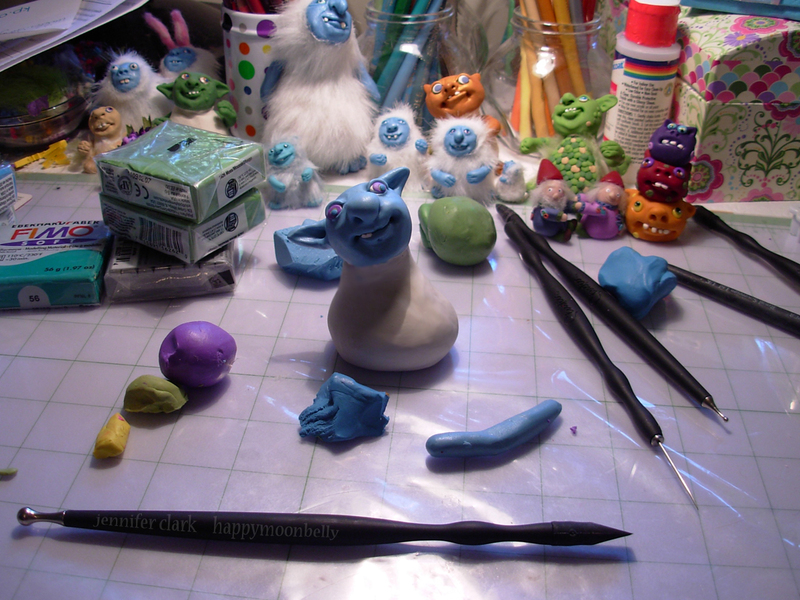 In the meantime, for all the folks who haven't really made anything with Polymer clay but love cute creations, here is a tutorial I found on youtube for a super super cute owl you can make. I hope you enjoy it!